Located in Brampton’s rapidly growing multi-cultural district, the Gore Meadows Community Centre & Library by ZAS Architects + Interiors was designed as a new anchor for the community. With highly sustainable design as its foundation, the Centre was recently honoured by Wood WORKS! 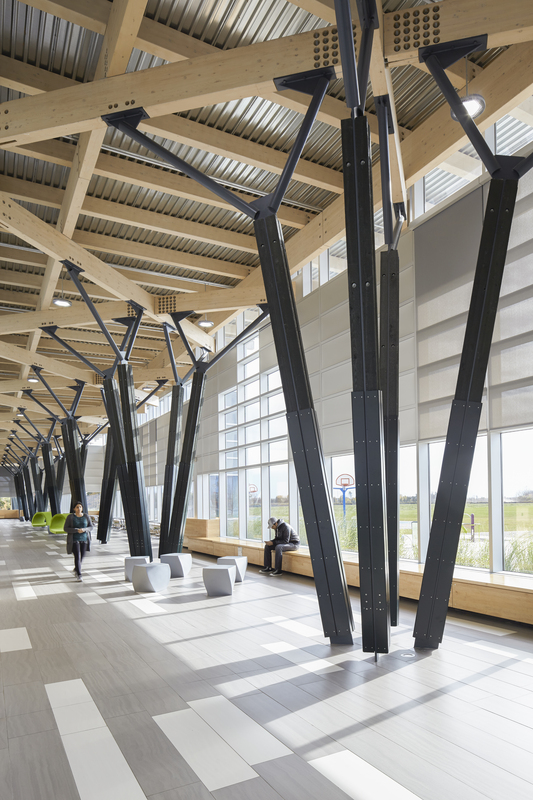 at the 15th annual Wood Design Awards for its clever integration of wood, a material that supports the Canadian economy and reflects the local community focus of the building. 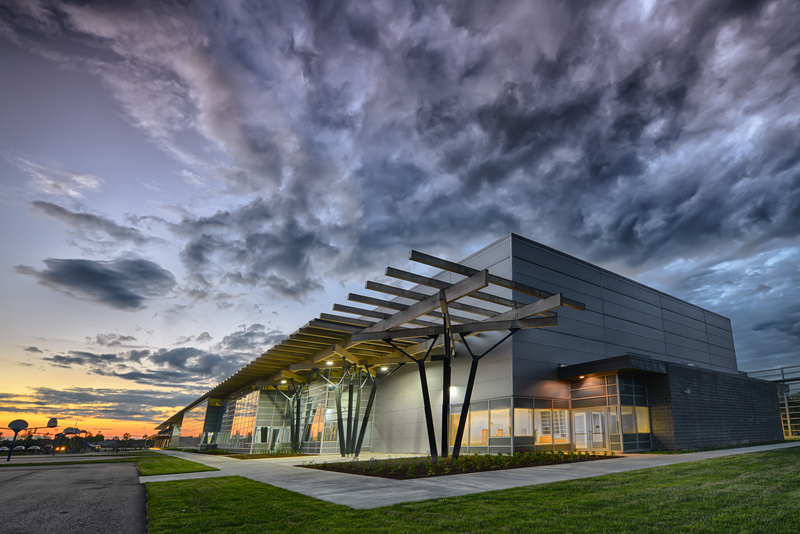 Located on a 143-acre site, the Gore Meadows Community Centre & Library received the award for Phase One, a 70,000 s.f. building housing a community centre and public library. Stretching across the main exterior façade and mirrored along the interior promenade, a timber framed public galleria plays heavily with wood, linking all of the facilities together. The award recognizes the project for design excellence, advancing the use of wood in large-scale commercial design. Working with the design community, Wood WORKS! is a national, industry-led initiative of the Canadian Wood Council that promotes and supports the use of wood in all types of construction. As wood continues to grow in popularity as a sustainable product in built forms, ZAS makes a point to use it where possible. Also the recipients of the 2014 Architect Wood Advocate Award, this project-specific award reinforces ZAS’ efforts to continue supporting Canada’s robust forest economy, keeping it sustainable and maintaining the country’s international leadership position in building with wood. 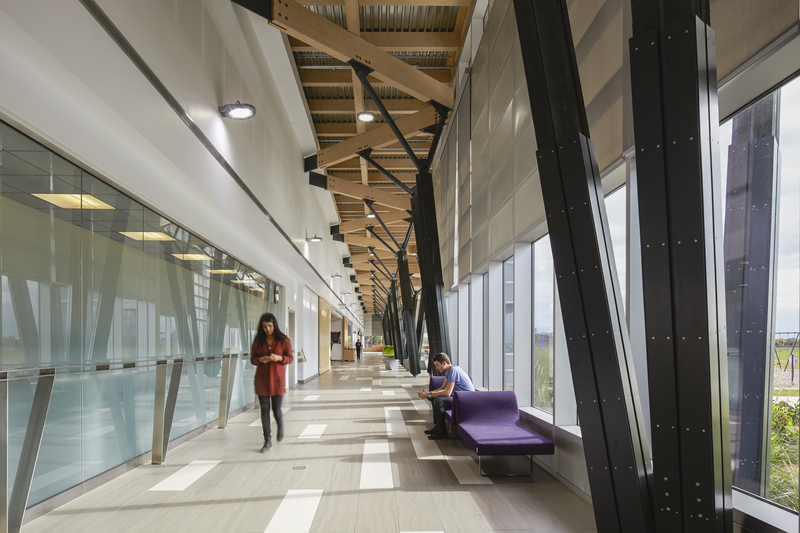 Beyond the use of wood, sustainable design strategies and systems were utilized throughout the building, resulting in a 40 per cent reduction in potable water usage, 25 per cent energy cost savings, and has received LEED Gold certification. Currently under construction, a Phase Two expansion of the Gore Meadows Community Centre will include an indoor aquatics facility, fitness centre, as well an an outdoor skating rink that incorporates a gently arching wood diaphragm Lamella structure above the ice pad. It is scheduled for completion in 2016.